Last night we ate a soup and salad combination for dinner and I made a batch of hummus dip that turned out great. Along with a recap of yesterday and a preview of today, I will share a few recipes including the hummus dip, and a tuna salad recipe, then finish with a preview of what today has planned with recipes and activities. We each ate a small side salad with a dollop of tuna salad on top leftover from the weekend before we started the ETL diet. The homemade fire roasted tomato dressing along with some more baked kale chips rounded out the salad. 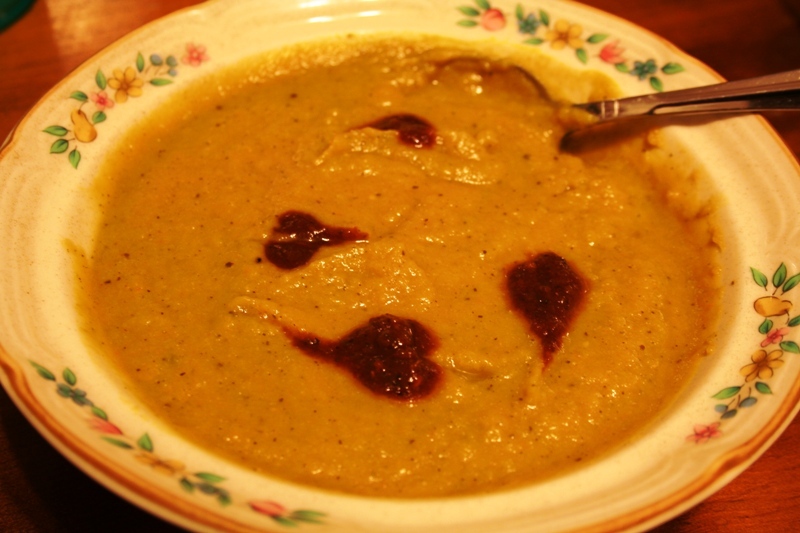 I also took the Anti-Cancer Soup and ran it through the blender to smooth it out even more, now it has a perfect consistency similar to a nice split pea soup. On the ETL diet you can eat fish up to two times per week, so this tuna is going to be our first portion for the week. By the way, 1 cup of the soup weighed about a 1/2 pound, so 2 cups of this soup will give you the equalivant of the 1 pound of cooked vegetables you are supposed to eat each day. I also garnished the soup with some little heart swirls of the fire roasted tomato dressing, which tasted great in the soup as well. See image below. Consume at least one pound of raw vegetables and one pound of cooked vegetables each day. Last night I spent about 30 minutes playing tennis and bowling on Wii Sports again, then spent an hour in the kitchen preparing the salad, hummus, and pureeing the soup. Once Monique returned from her 30 minute workout at Curves, where she burned 459 calories we then both went on our regular evening neighborhood walk, which was another 30 minutes of good aerobic exercise. We then watched American Idol last night, and typically when sitting in front of the “idiot” box I am tempted to snack, but since being on this diet, you get to eat all the fruits and vegetables you can fit in your stomach and we have not had any cravings at all. Only a Clementine here or a few dates there, which are included in the diet plan. Eating healthy and nutritious meals of raw and cooked vegetables satisfies, and results in less cravings for junk food or snacking. Today we ate some oatmeal that I prepared with 1 3/4 cups water, 2 teaspoons of honey, 1/4 cup of raisins, and 1/2 tsp of cinnamon. Monique at about 1/2 cup and I had a cup. On the ETL diet you are limited to 1 cup of whole grains or starchy carbohydrates a day. Today’s lunch Monique has a salad with the fire roasted tomato dressing, a small bag of sliced cucumbers, hummus for dipping, one ounce of walnuts and macadamia nuts mix, an immunity drink and a Clementine. I ate a bowl of the Anti-Cancer soup with some baked kale chips on top, an ounce of the walnuts and macadamia nut mix, and a few dates. Tonight I am going to steam some fresh spinach and cook down some kale with onions and celery. 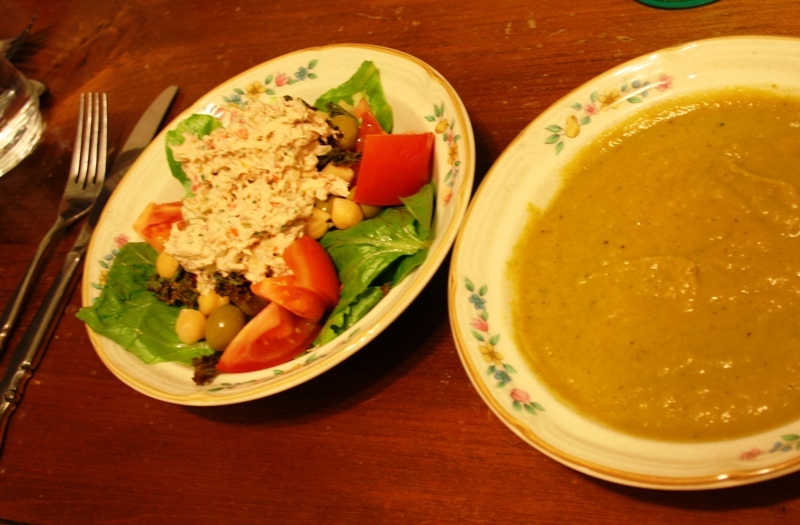 Along with more Anti-Cancer soup and a small side salad that will round out day 4. I may also make a batch of blueberry dressing and some eggplant dip. Indeed, recipes will be forthcoming. Tonight Monique goes back to Curves for the circuit workout and then we both will walk this evening. In addition, I will also get back on the Wii Sports and will try to get some Wii Fit workout also. It really does work and is so much fun! Good luck on the diet. The kale chips and hummus sound excellent. The exercize is important. Kepp up the good work!